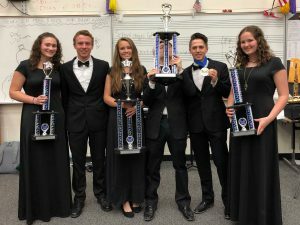 Congratulations to WVHS Honors Wind Ensemble and Jazz Ensemble, first-place winners of the Music in the Parks Festival and competition in Agawam, MA, last weekend. The Jazz Ensemble received the top trophy for the highest scores in its class. Sophomore Granger Ottley was honored with the most outstanding jazz soloist medal. Both bands received the “Esprit de Corps” award for demonstrating the best spirit, professionalism and maturity throughout the festival.